Marcela had to be out of the house by 7.15 this morning, I was up at my usual time of 5.30am, but this time ensured that Marcela got up to, instead of rolling over and going back to sleep! I took the dogs for their walk, it was obvious that we were in for a hot day, so I started by trimming the azulina hedges before the sun came up, and before Marcela left, even then by the time I was on the last stretch of hedge, the sun was up over the mountains and in my eyes. Marcela departed, so I had my breakfast, sharing as always with the boys, I really should be slim, the amount they help me out! Then I walked up to the local Water Company office, it's only two hundred yards up the road, to collect a document we needed, it was not ready, so the Manager did it whilst I waited. 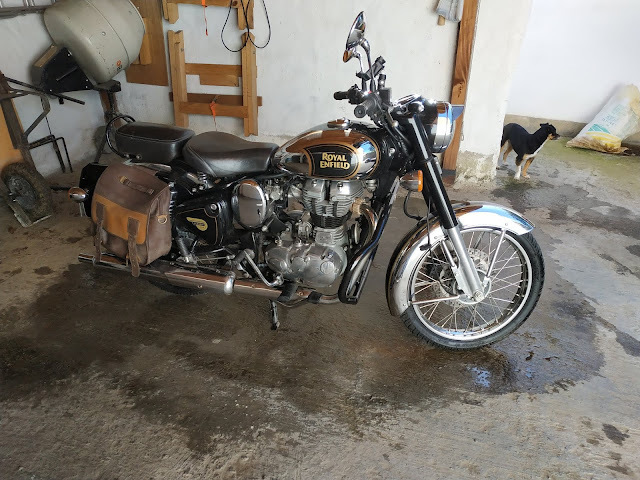 My attention then turned to the Royal Enfield, it was time for a wash and polish, the washing was not so hard, as there is not much of it, and using the leaf blower it is soon dried, so then came time to polish, it came up like a treat. With it's mirror finish, I couldn't just put it back in the workshop, I changed into my gear, and headed off down to Niquía (Bello), the nice thing about the bike is that the Toll Road is free, they have a separate lane to one side, so bikes can just pass through, although there is talk that they intend to change that, in the name of 'Greed'! I wanted a new kettle, as ours had packed up over the week-end, but it appears kettles are not popular, all the places I had seen them previously no longer had them, and Homecenter only had the option of four, so as beggars can't be choosers, I selected one, which just fitted in my saddlebag, and headed home, stopping off for brunch on the way. Bike looks great ! enjoy the trips out.